A hot tub is a great place to relax and unwind with friends and family members. Is the area outside your hot tub as appealing as it is on the inside? 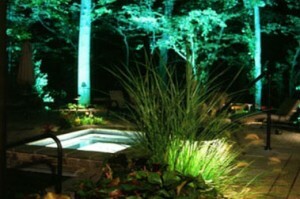 Professional lighting around your spa or hot tub can transform your yard into an inviting retreat, while proper irrigation ensures that the trees, shrubs and flowers surrounding your hot tub add to the atmosphere of peace, beauty and tranquility. Remember, less ‘hose dragging’ time equals more hot tub time! Contact a member of our staff today to find out more.